According to the Oricon Singles charts for October 8, the "Kuroko no Basuke Character Song Duet Series Vol. 3" single released on September 26 sold 24,886 copies in five days to rank at #3 for the week's CD single sales. 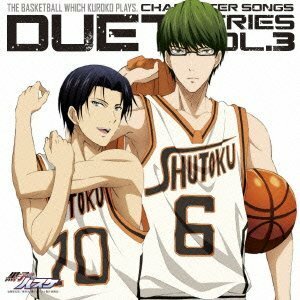 The single features songs and a mini drama from characters Shintarō Midorima (voiced by Daisuke Ono) and Kazunari Takao (voiced by Tatsuhisa Suzuki). This is the first character song single for the series that has ranked in the top three on Oricon's chart. Shueisha released the 19th volume of Tadatoshi Fujimaki's original Kuroko no Basuke sports manga last month. Production I.G's television anime adaptation of the series ended on September 22 and the series will receive an original video anime included with the eighth Blu-ray Disc/DVD volume of the television anime series in February. Crunchyroll streamed the television anime into several countries as it aired in Japan.